When my 13-year-old granddaughter, Lotti Boecker, visited from Germany this summer, we discovered a delightful new outlet for our shared love of drawing. The Beautiful Book of Exquisite Corpses: A Creative Game of Limitless Possibilities, edited by Gavin Edwards, is a series of incomplete drawings by an eclectic array of cartoonists, animators, tattoo artists, drummers, novelists, DJs, and many others. The book was inspired by the games André Breton and his surrealist friends used to play in an effort to tap the endless creative syrup of the subconscious. Edwards, the author of nine books, including The Tao of Bill Murray, likens the finished drawings to the chimera of Greek mythology, which had the head of a lion, the body of a goat, and the tail of a serpent. 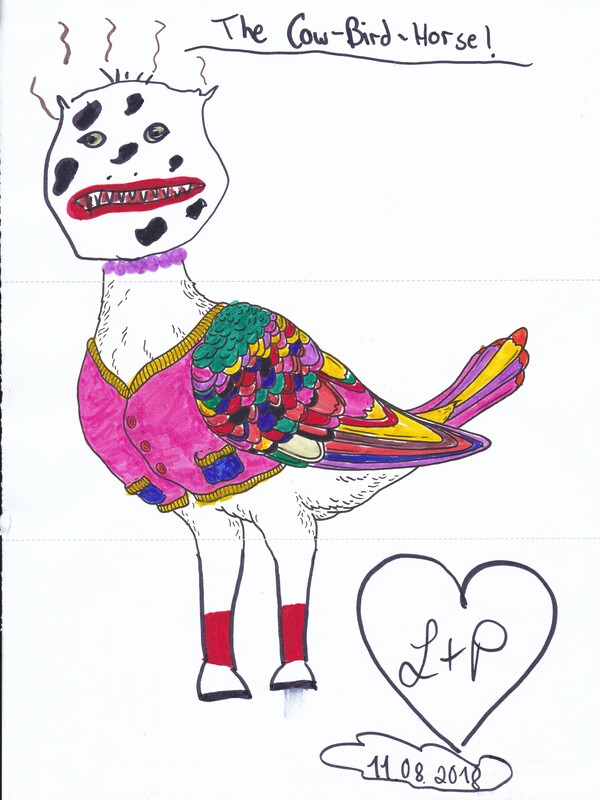 Though we didn’t read the instructions till we had finished drawing, Lotti and I did manage to produce a chimera of our own (see first image below). “Even if you ignore my instructions,” Edwards promises, “you’ll probably still have a lot of fun.” He’s right. We had a blast. Lauren Purje, a Brooklyn-based artist, cartoonist, and pigeon enthusiast, is author of You Might Be an Artist If …, a series of comic strips about the struggles and joys of making art. Expanding on Purje’s sweater-wearing pigeon’s midriff, Lotti and I wound up creating our own chimera. Christopher Noxon gave us a headless man getting ready to tuck into a short stack of buttermilk pancakes. 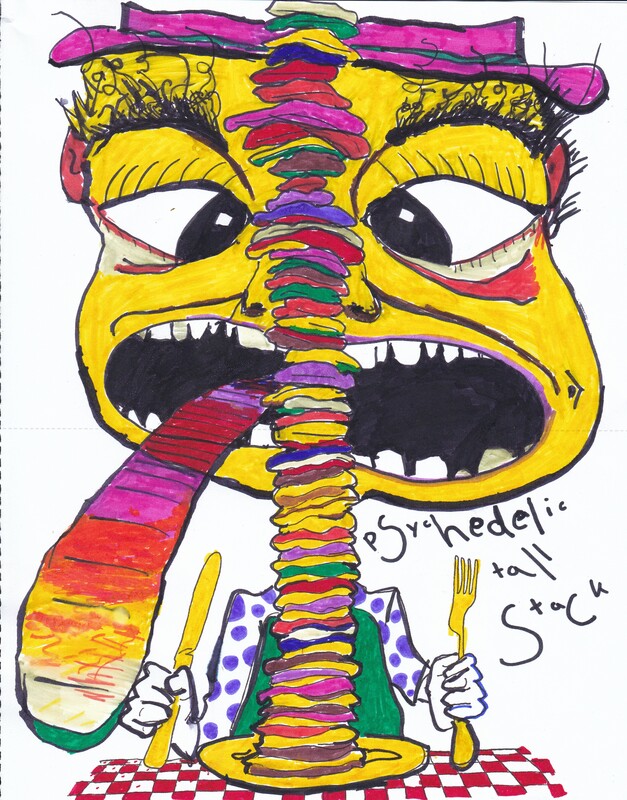 Lotti and I went tall—and psychedelic. Noxon is the author of the novel Plus One and Rejuvenile, a book about grown-ups who act like kids. He’s working on a collection of essays about civil rights and resistance. 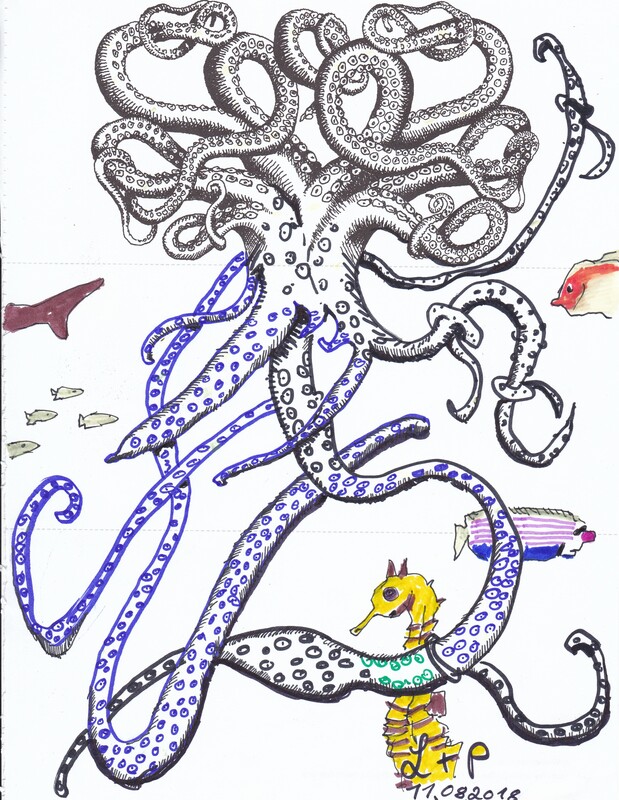 Wesley Mancini gave us part of an octopus, and we ran with the possibilities of multiple tentacles and multiple suctions cups, along with some friendly fish neighbors. Mancini is a renowned fabric designer whose studio has produced more than 30,000 textile designs. 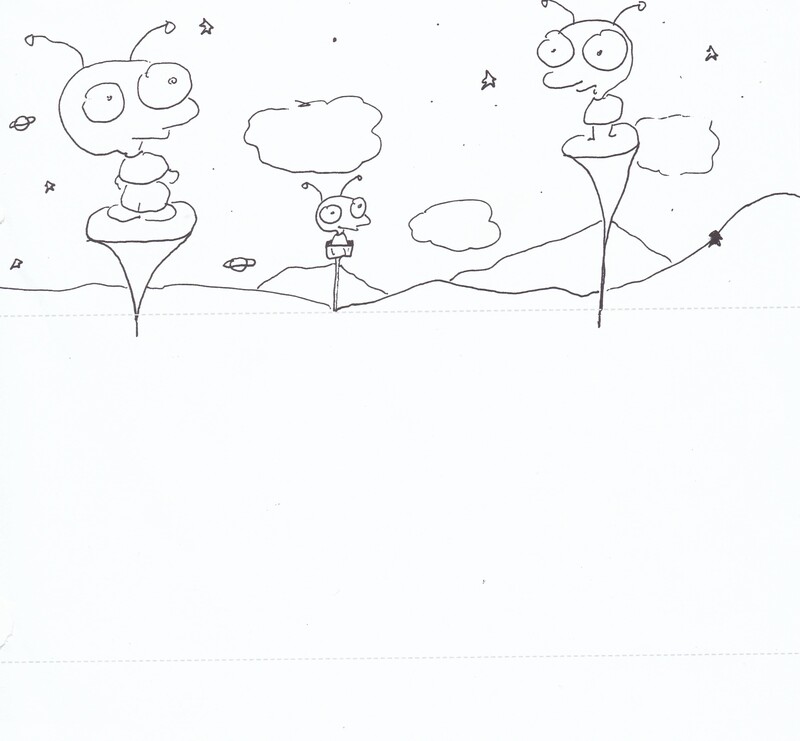 These frisky little space aliens came out of the fertile mind of Moby, musician, author, and animal rights activist. They’re obviously not dummies because they have no desire to meet Donald Trump. What will fill the blank space? Give it a shot!